This recipe is 6 SmartPoints per serving, 1 taco and 1/2 cup filling. In a large ziplock bag, place the steak and all the spices and ingredients except the Coca-Cola Life, taco shells and coleslaw. Make sure to cover the steak with the marinade completely. Place in the refrigerator and marinate at least 8 hours, or overnight. Spray the slow cooker insert with olive oil spray. Place the contents of the ziplock bag including the marinade into the slow cooker. Add the Coca-Cola Life to the slow cooker. Once the meat is done cooking, take it out and shred it. It should be easy to pull it apart and shred. Set it aside. 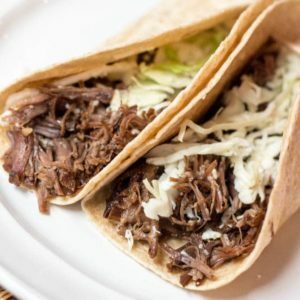 Assemble the tacos by getting a taco shell, filling it with the meat (and sauce if you want) and top it with coleslaw, if using. Serve immediately.